Racetrack Road approaches from the north and skirts the west side of Racetrack Playa in the shadow of Ubehebe (yuba-he’-be) Peak. We crested the saddle above the playa’s north perimeter and dropped out of the gray soup that had confined our world for about two hours. Before us spread the entire Racetrack Playa, its surrounding mountains draped in clouds that cascaded down their slopes like slow motion waterfalls. The light rain that had barely required windshield wipers stopped completely. Descending the saddle’s south side into the basin, our view was monopolized by the Grandstand—a cruise ship size chunk of adamellite (a dark, igneous intrusive rock similar to granite) jutting from the paper-flat playa. This is what the submerged portion of an island looks like. As we rolled past I couldn’t help thinking that the Grandstand would be a far more sought-after subject were it not for the moving rocks that take top bill here. As much as I’d loved to have stopped to photograph the Grandstand, it was late afternoon and I was anxious to locate the main attraction before the good light came and went. The drive to the south side of the Racetrack is just one mile, but the road’s extreme washboard surface is a natural speed inhibitor; every time my speedometer nudged toward fifteen miles per hour our SUV started bouncing like an off-balance washing machine and I had to back off. Doug, Jay, and I had chuckled when the Stovepipe Wells grocery clerk told us that the rocks had mysteriously disappeared from the Racetrack, but I’ll admit to taking advantage of our slow speed to (anxiously) scrutinize the playa as we skirted its perimeter—what if it was true? Vibrating along, I saw a couple of grapefruit-size rocks trailing short tracks just west of the Grandstand, but nothing like the rocks we’d come for. We finally stopped at the playa’s extreme south end where a couple of photographers were photographing a handful small rocks just a couple of hundred feet from the road. 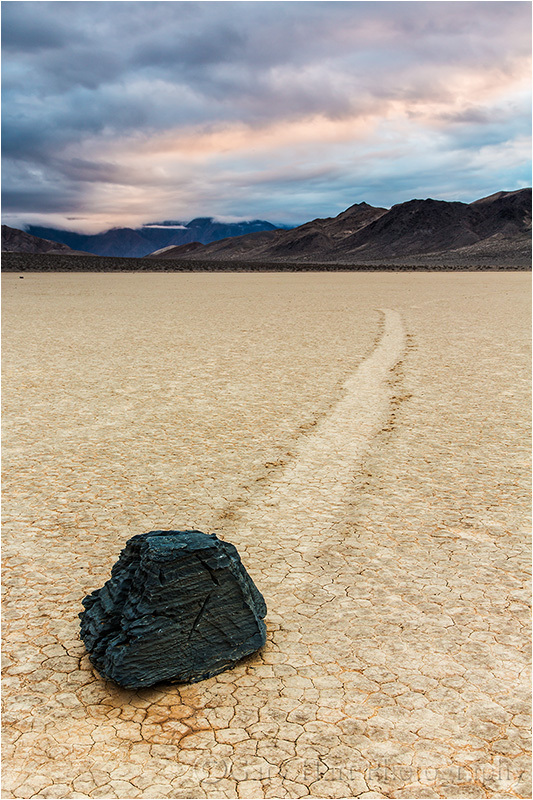 These rocks just didn’t seem natural to me—partly because of the nearby tire tracks marring the playa’s surface (the selfish ignorance of humans in nature never fails to disappoint me) and partly because they were so far from any rock source (these things don’t just drop from the sky). Standing there on the playa’s southwest edge, it was clear that the rocks we sought could only originate from the base of the steep mountain abutting the southeast corner. And indeed, looking more closely in that direction, we could just make out a large accumulation of black dots that could only be rocks. The playa’s utter flatness can be disorienting, but given that the Racetrack stretches one mile on its long, north-south axis, I estimated that the east side was about a half mile away. So off we set. The playa’s color and chalky dust reminded me of a flour tortilla; its surface is a jigsaw of round polygons about three inches in diameter, separated by shallow cracks that have been filled in by the fine dust. When dry like this (there was no noticeable accumulation of the nearby rain) it’s an easy surface to walk. After ten minutes we arrived at the first rocks, toaster- to microwave-size, each with its own straight, curved, or zig-zag track. Eureka! We immediately spread out, claimed a specimen of our own, and went to work. Initially the best light was on the southwest horizon, where a hole in the clouds, obscured by Ubehebe Peak, passed enough sun to illuminate the low overcast (see the image in my previous post). Soon our attention was drawn to the playa’s north end, toward the Grandstand, where a shaft of golden light had started skimming the dark hills and firing up the clouds there. I quickly circled the rock I was working on to swing my camera in that direction. As the shaft warmed it stretched further, eventually extending from edge to edge. As the light seemed to reach a crescendo Doug, who was set up about a hundred feet away, called out, “That almost looks like a rainbow.” I looked closer and sure enough, there was indeed a (quite faint) prism of color splashed above the sunlit hills bounding the playa’s northeast edge. The one frame with my polarizer properly oriented for the rainbow that I managed to get off is at the top of the post. You have to look closely to see the rainbow (it’s there, I swear); careful examination reveals that the rainbow moves from green on the outside (left) to red on the inside (the shorter wavelength colors that would be left of green aren’t visible), meaning that our angle of view only gave us the fainter, outer band of a double rainbow. By the time I’d set up my next composition the light faded and with it the rainbow. Visions of a full rainbow arcing above the Racetrack dashed, we nevertheless couldn’t help feel that we’d been granted a very rare treat in this land of interminable blue sky. The rest of our trip, though not without its moments, was anticlimax. After sunset we walked back to the car and ate dinner (soggy sandwiches for Jay and me, ramen noodles for Doug-the-chef), then went back out in the dark for a moonlight shoot without stars. By then the clouds had thickened and dropped, making it difficult to get anything that really looked like night. After a very restless night (one hour awake for every hour asleep for me), we rose for “sunrise” (or more accurately, “fogdrop”). While not quite spectacular, the low clouds swirling above the playa, spilling down the mountains in the thin light no doubt gave us unique images (that I haven’t had time to get to). And on the drive back we were able to see the terrain that had been completely obscured by clouds on our inbound trip, the highlight of which was several miles of joshua tree forest we’d been completely oblivious to earlier. In fact, despite my extreme need to be back in Furnace Creek in time for my workshop (that started at 1:00 that afternoon), at one point we encountered a scene with nearby joshua trees juxtaposed against distant, fog-wrapped mountains that we couldn’t help stopping to shoot for fifteen minutes or so. After depositing Jay at his car in Stovepipe Wells, Doug and I made it back to Furnace Creek by 11:45 and managed to clean up, have lunch, and set up for orientation with time to spare. Piece of cake. A couple of weeks ago I got the bright idea to spend the twenty-four hours separating my two Death Valley workshops with a trip out to the Racetrack. While it seemed like such a good idea at the time, as my first workshop drew to a close I started longing for a bit of recharge time before the next one (it didn’t help that the first workshop’s final night was in Lone Pine near Mt. Whitney, an hour-and-a-half drive from Death Valley). But since I’d invited my brother Jay (who assisted my first workshop) and friend Doug (who would assist my second workshop), and they’d changed plans to join me, I sucked it up and made the trip (much to my ultimate delight). You’ve probably seen pictures of the Racetrack, which, like many features in Death Valley, defies common logic. 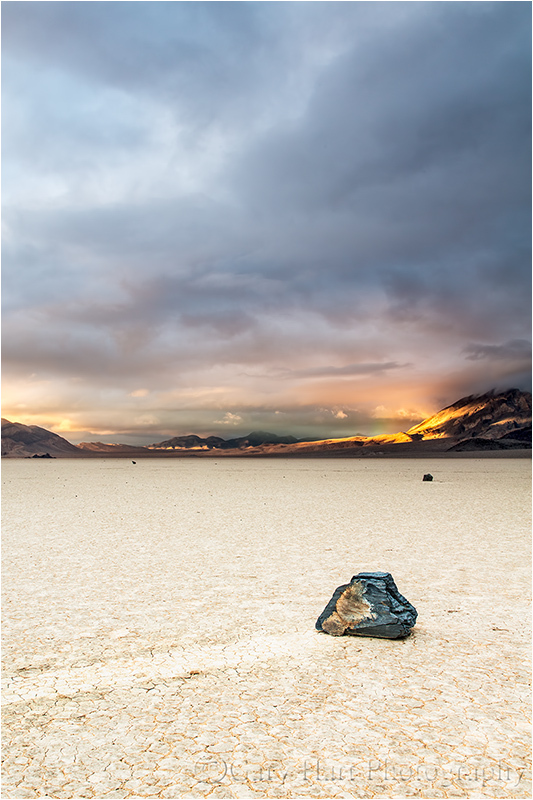 The Racetrack is a perfectly flat playa (dry lakebed) surrounded by rocky mountains that frequently shed large chunks of dolomite, many of which come to rest on the playa surface. But unlike the rocks you and I have known, the Racetrack rocks move. A lot. And as they scoot along the playa they carve tracks in the otherwise flat surface, sometimes several hundred yards long. The creepiest thing is that nobody has actually seen these rocks move. Science still doesn’t have a perfect explanation for what goes on here, but the general consensus is a combination of water, wind, and (possibly) ice is involved. A major part of the Racetrack legend is the road out there. It’s a two hour drive on twenty-seven unpaved, unpatrolled miles of sharp rocks and jarring ruts. The road, a notorious tire eater, twists up to 5,000 feet elevation before dropping back down to 3,700 feet at the playa. Given the time and effort it takes to get to the Racetrack, our plan was to land in time photograph sunset, wait for dark and photograph by moonlight, then throw down sleeping bags and spend the night, rising early enough to photograph sunrise. Armed with my rental SUV, if all went as planned (no flat tires), we’d make it back to Furnace Creek by noon and (fingers crossed) have time to clean up and eat lunch before starting workshop number two at 1 p.m. Piece of cake. So, at the conclusion of workshop number one, my brother and I hustled back from Lone Pine and picked up Doug in Stovepipe Wells. Before setting out we made a quick stop in the general store, where the clerk reported that a recent Racetrack visitor had told him earlier that day that all the rocks had been stolen. Hmmm. Undeterred, we set off on our adventure with high hopes. A light rain fell for much of the drive, quite unusual in this arid region that gets less than two inches of rain per year. And with rain comes clouds, one of which we entered not long after turning onto Racetrack Road. Instantly the visibility dropped to about one hundred feet and remained that way for much of the journey. Of course the lack of a view was of little concern to me, since my eyes strayed from the road only long enough check the dashboard tire pressure indicator. Given the limited visibility and my targeted focus, I’m afraid I have little to report of the journey, except that it was with great relief that we somehow pulled up to the playa on schedule and without consequence. The rest of our adventure will need to wait until my next post—until then, above I offer proof that we did indeed make it, and that the trip was very much worth the effort.